Kenneth Brandon from southern California filmed a stunning time-lapse of the famous Perseid meteor shower that has to be seen to be believed. 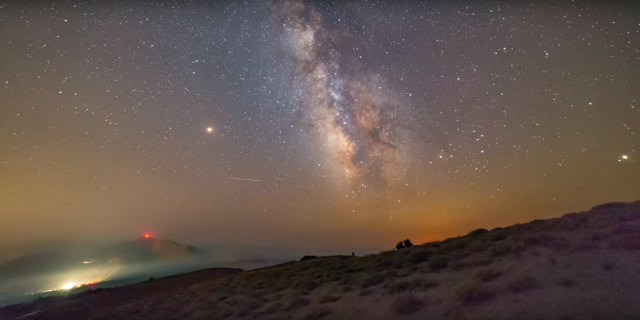 The amateur astronomer shot around two hours of footage overlooking Mammoth Mountain, California, and condensed it down to four minutes. Brandon works as a director of engineering, but turns to astronomy on nights and weekends; his dedicated astronomy YouTube channel has more than 30,000 subscribers. The annual Perseid meteor shower is caused by debris falling from the tail of Comet Swift-Tuttle and burning up when it comes into contact with the Earth’s atmosphere. In 2018, the Perseid meteor shower is visible from July 17 to August 24.